After your arrival at Delhi's airport, our representative of ITS will assist you and help you in reaching the hotel. Overnight staying arrangements will be made at the hotel. 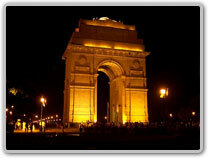 At the second day of our tour, we will explore our capital city-Delhi. We are sure that monuments like Red Fort, Raj Ghat, Shanti Vana, India Gate, Qutab Minar, Laxmi Narayan Temple and Lotus temple and bazaars of Chandni Chowk surely going to mesmerize the tourists with their enchanting beauty. In evening, tourists are free to spend time with your near and dear ones or indulging in any kind of entertaining activities. In the early hours of morning, we will checkout from hotel and leave for Jaipur. As soon as we arrived at Jaipur, first we will spend some hours in the hotel, then in the late evening, we will start with our trip. In Jaipur, places like Sisodia Gardens, Birla temple and temple of Galta are worth exploring destinations. Tourists will surely be entertained while having continental and Rajasthani cuisine in an ethnic resort of Chokhi Dhani which is well complimented by background music and live puppet show. Then in night, we will come back to hotel for making an overnight stay. At this day, we will cover some of the major monuments for which Jaipur is famous. Amber Fort, City Palace, Hawa Mahal and Jantar Mantar are some places without which tour to Jaipur will not be completed. After having our lunch, rest of the day will be kept free for tourists so that they can indulge in any other activities like shopping, etc. We will checkout in the morning from Jaipur's hotel and drive towards Agra, enroute visiting historical monument namely Fatehpur Sikri which depicts the story of bygone era through its Buland Darwaza, Tomb of Shaikh Salim Chisti and Jama Masjid. Once we arrived at Agra, tourists are free to relax during afternoon. Then in the evening, we will start with our sightseeing tour to sites like Diwan-e-Am, Diwan-e-Khas, Jehangir Palace, Octagonal Tower, etc. Late in the evening, we will visit the "symbol of love"- The Taj Mahal. Afterwards, tourists are free to unwind themselves by making shopping in the famous Inlay Handicraft markets of Agra. Then, in night we will be back to hotel for making an overnight stay. On the requests of tourists, we can visit to Taj Mahal in the wee hours of morning. Later in the morning, we will checkout from hotel and head towards Gwalior. After arriving at one of the hotels of Gwalior, tourists can spend some time in leisure till evening. Then in the evening, we discover places of interests like Gwalior Fort, Man Mandir and Jai Vilas Palace. All these places are famous for their architectural beauty and tourists love exploring these places. After visiting these places, tourists are free either to relax in hotel or spend some time by roving around near hotel area. In the morning, we will proceed towards Orchha and stay at hotel. Orchha, a beautiful town situated in the state of Madhya Pradesh, was founded in 1501 A.D. by Rudra Pratap Singh. 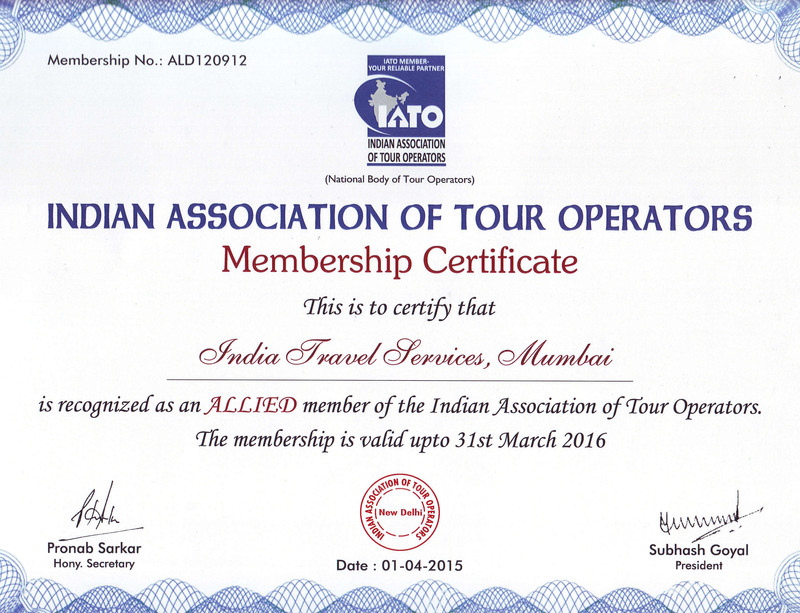 The place offers myriad tourist destinations like Jehangir Mahal, Raj Mahal, Dinman Hardaul's palace, etc. The striking temples of Ram Raja and Chaturbhuj are worth watching. 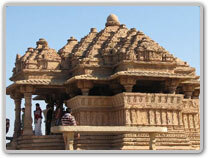 During morning, we will checkout from hotel and drive towards Khajuraho. After arriving at hotel, we will visit temples like royal Lakshmana Temple- dedicated to Lord Vishnu, Lakshmi and Varaha temples, Chausath Yogini temple dedicated to Goddess kali, Lord Shiva temple of Kandariya Mahadev. 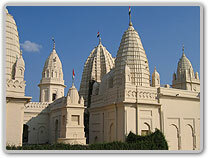 All these temples comprises under category of western group of temples. We will start our excursion by visiting Archaeological museum which stores rare collections of sculptures of stones of Chandela Dynasty. Then, we will explore Eastern group of temples of Khajuraho and those temples which are specifically dedicated to three Jain Tirthankars- Adinath, Parsvanath and Shanti Nath. We will also pay a visit to Lord Vishnu's temples- temple of Vamana and Hanuman/Brahma. Evening is free to spend in the manner in which tourists desire for. Overnight stay at the hotel is planned. Next day, in the morning tourists are free either to relax in the hotel or rove around in nearby areas of hotel. In afternoon, we will proceed towards airport to take the Varanasi's flight which is scheduled to leave from the airport at 1335 hrs and reach at Varanasi at 1415 hrs. After arriving there, primarily we will be guided by ITS representatives and transfer to hotel. After relaxing for considerable hours, we will start our sightseeing tour by visiting places like Sarnath, Deer Park and Bodhi Tree. People from far flung areas come here to visit Bodhi tree because of the fact that Gautama Buddha has achieved enlightenment under this tree. Late in the evening, we will return back to Varanasi for an overnight stay. In the early morning, we will visit to the Ghats of the River Ganges by boat and watch the magical scenes of people taking a dip at the sacred water of the Ganges River in an attempt to clear-off their sins. After that, we will come back to hotel and then move to pay a holy visit to innumerable temples of Varanasi like Golden temple and Durga temple or Monkey temple. Durga temple is also recognized with the name of Monkey temple as one can find a large number of monkeys under the premise of temple. During evening, tourists can again enjoy the boat riding in the Ganges River if they desire for. At that day, in Varanasi we have planned for an overnight stay. Optional extension tour of Nepal. Day 12: Varanasi - Delhi (By air) - Back home. In the morning, tourists are free to relax, and thereafter we will travel towards airport to board on scheduled flight at 1240 hours for Kathmandu. We will reach at Kathmandu at 1350 hours and from there will first travel towards hotel. Rest of the day is free to spend in any manner- either by enjoying shopping in the local market of Kathmandu in Thamel or by relaxing at hotel. Kathmandu boasts of offering myriad scenic and majestic beauty through its Himalayan peaks or forts. Tourists will be given two options; either they can enjoy a close overview of numerous Himalayan peaks or visit the Hanuman Dhoka Palace. We will also make our tourists visit to famous hilltop Stupa of Swayambhunath which is believed to be 2000 years old. During night, we will arrive at hotel in Katmandu. In the morning, we will visit famous Hindu shrine-Pashupatinath temple. Then, we will visit Guheshwari temple which is situated at nearby distance of Pashupatinath temple. Later, we will travel towards Boudhnath Stupa which is considered as one of the largest stupas in the world. Then, in the evening we will visit spiritual city Patan and royal city of Bhaktapur and Durbar Square and many other well-renowned temples, shikhars and stupas. After visiting these places, we will come back to hotel for an overnight stay. In the morning, we will move to airport to take on the flight for Pokhara which is scheduled at 0900 hours. Once we arrived at Pokhara at 0945 hours, we will rest in the Lake side hotel. Tourists are free to explore stunning exquisiteness of Pokhara on their own. In the morning, we will start with our excursion to Pokhara by exploring beauty of Davis Falls, Mahindra Caves, Binde Basini Temple, Phewa Lake and Seti George. During evening and night, tourists can relax by staying at hotel. We will checkout from hotel in the morning and move towards to airport to catch the flight of 0900 hours for Katmandu. After arriving at Katmandu at 0945 hours; till 1300 hours, tourists are free to rove around here and there in Katmandu. After that, we will catch the flight for Delhi which is scheduled to leave from Kathmandu's airport at 1420 hours and reach Delhi at 1540 hours. After reaching Delhi, we will first move to airport hotel where our tourists can stay till the time they checkout from the hotel. After farewell dinner, tourists can leave for their respective destinations by boarding flight back to their native place.